"An essential read for anyone who wants to properly understand political and economic policy developments over the past 15 years and enjoy some good insights about the future." Neil Kinnock, Vice President of the European Commission and former leader of the Labour Party. "For twenty years one of the most sceptical and authoritative voices on economic affairs in the British press." Robert Harris, best selling author. "A splendidly vivid account of the background, outlook and record of the most powerful Chancellor of modern times." Anthony Howard, biographer and political commentator. The economic policy of new Labour has been fundamental to its success. 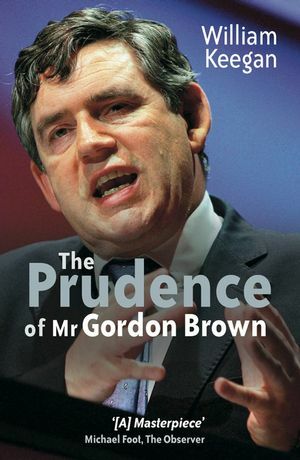 Gordon Brown has been at the very heart of new Labour's economic policy since the late 1980s and has been highly instrumental in convincing both the British public and the City that a Labour government can run the economy responsibly. He has generally been a popular and well-respected Chancellor - during his early years in office, he was highly praised for his prudence and yet now, well into the second term of office many of the issues on which the Blair government was elected, such as health and education, have not yet been satisfactorily addressed, and Gordon Brown is now being criticised for what many see as his imprudence in handling the nationâ? ?s finances. Examining how successful Labourâ? ?s economic policy has really been, when allowing for the good fortune of a world-wide economic boom, Keegan provides insights into the policies of new Labour, Gordon Brown's rise to power, the impact of his policies and how future policies might influence the economy. William Keegan is Associate Editor (since 1983) and Economics Editor (since 1977) of The Observer newspaper. A graduate of Trinity College, Cambridge, he has previously held posts with the Financial Times, Daily Mail and Bank of England Economic Intelligence Department. He has sat on a range of advisory committees, including the BBC Advisory Committee on Business and Industrial Affairs, the Employment Institute Council and the Department of Economics Advisory Board, University of Cambridge. He is visiting Professor of Journalism at Sheffield University and is the author of a variety of successful books. William Keegan is an Associate Editor senior columnist of the Observer newspaper. he is a well-Known and highly respected journalist who has been close to the heart of politics and economic policy in Britain for many years. He was previously with the Bank of England's Economic Intelligence Department and before that was Economics Correspondent of the Financial Times. He has sat on a range of advisory committees, including the BBC Advisory Committee on Business and Industrial Affairs, the Employment Institute Council and the Department of Applied Economics Advisory Board, University of Cambridge, He is Visiting Professor of Journalism at Sheffield University and a Governor of the the National Institute of Economic and Social Research. William Keegan is the author of many successful books, including 2066 and All that, The Spectre of Capitalism, Mrs Thatcher's Economic Experiment, Mr Lawson's Gamble and Britain Without Oil. 4. Labour and the ERM. 5. From Black Wednesday to the Granita restaurant. 6. From Granita to government: the advent of Mr Balls. 7. In central banks we trust. 8. Battle of the Titans. 9. The independent bank in action. Conclusion — ‘It’s a long game’.